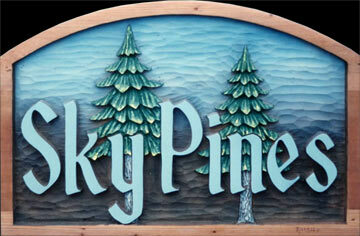 Since 1971, We have created custom hand carved residential and commercial redwood signs in the Lake Tahoe region. 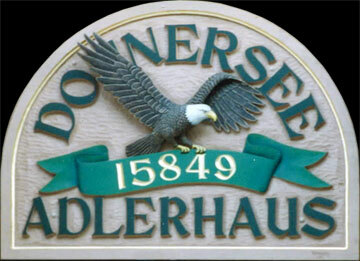 Since 1996 we have been shipping signs nationwide. 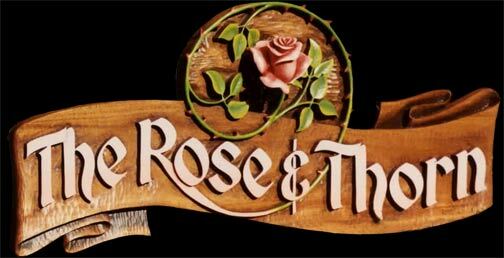 Our signs are unique in our hand carving and painting technique as well as our raised letters and relief carving. 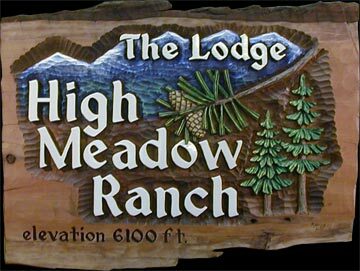 Carved redwood signs add a custom artistic accent to any cabin, lodge, ranch, farm, country house or bed and breakfast inn. Please scroll all of the way to the bottom to see the many different options. 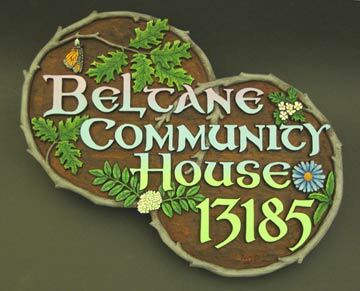 Custom made hand carved wood signs, hand carved doors, nature, wildlife & traditional architectural wood carving and wood sculpture. 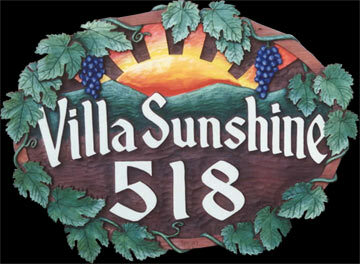 Residential signs can be ordered either over the phone or by email. 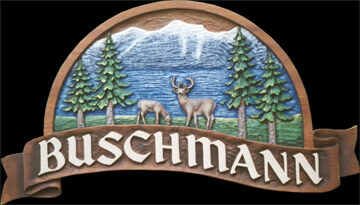 We can carve any of the designs you see on this page or we can design a sign with any subject or image. 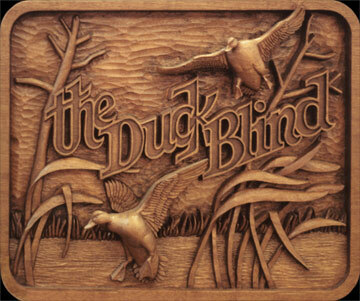 Don't be afraid to suggest any idea you might have for your carved wooden sign. 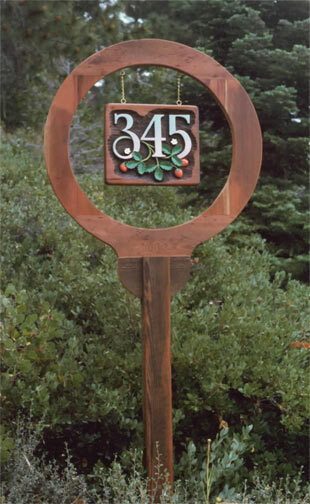 Prices are determined by size, design and the amount of labor required to create your own individual piece of art. 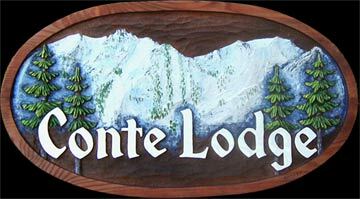 We can carve signs any size you choose. 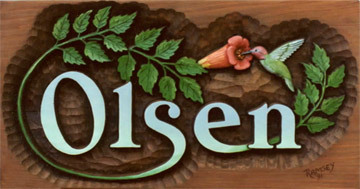 The design can be low relief, high relief or 3 dimensional high relief. A few of the signs on this page are priced to give you an idea of cost. Email or call for pricing on other designs. For custom designs, we ask for a drawing deposit for a rough sketch that is applied to the price of the sign when you order. If you want a more detailed drawing, we charge a drawing fee that is in addition to the price of the sign. Shipping and handling is extra. For orders to be shipped to California, sales tax will be added. 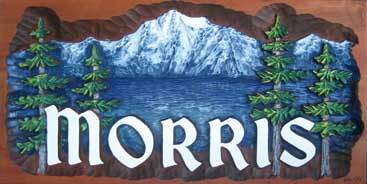 For signs that cost $500 or less, we require full payment, including the shipping cost, with the order. 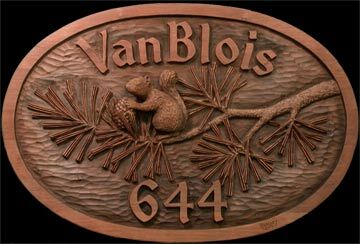 For signs that are more than $500, we require a 50% deposit with the order and the balance is due, including shipping on completion. 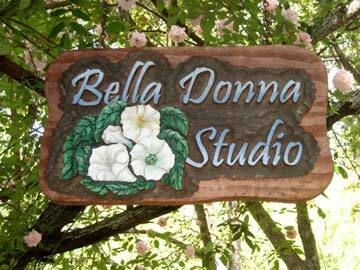 We will email you a photo of the completed sign. We accept personal checks.